For anyone who has ever been a fan of Gangster Movies, I'm pretty sure you noticed the brash looking style fashion suits that Characters playing thugs on film were wearing with their Stacy Adams Shoes. We would always see the Gangster villain wearing Fancy Suits and fancy dress shoes that literally stick their thumb in the eye of authority and quiet suit fashion style. These were not muted looking like a Pinstripe suit. Suits that simply could not be ignore for their eye catching style and impossibility of blending into the crowd when what their criminal enterprises on film should be done quietly. These don't look anything like a Prom Suit. If you are a gangster and are wearing a bright color suit like a Red Suit, you know or should know that you are easily visible but this is exactly what the Gangsters always wanted and visibility which partly would end in their downfall in the movie. Let's face it, a Gangster wearing a brash looking suit whether it's brightly colored or has loud pinstripes driving a fancy luxury car that has been pimped out is going to noticed by all, and by all that included the Police. For some reason though, that never becomes a consideration for the villain and next thing you know the cops are doing overtime working on arresting this brash bold gangster. During the 1930s, Gangster movies you would have characters like James Cagney who was no ones fool rising to the top of his seedy underworld killing anyone who got in his way or who he thought was in his way wearing flashy looking Mens Suits which usually consisted of a bold striped double breasted suit with wide lapels. Now this type of suit is now called gangster stripe for several reasons. 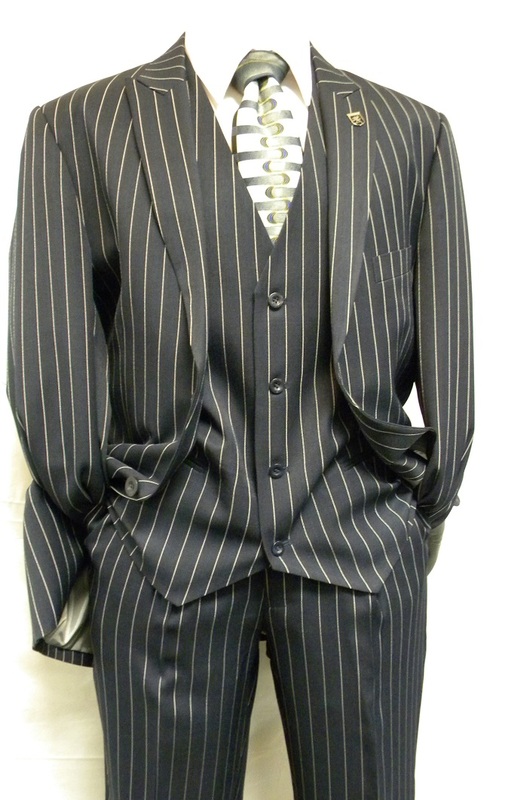 First, most mens suits that are used for business aren't trying to have bold looking stripes on it like gangster stripes but try to have more muted looking stripes or patterns. You're not supposed to be loud dressing in the business world at all. Second, the lapels were usually wider than your general suit lapels, which immediately tell a person that you were what you like and you're not another empty suit in an office somewhere toeing the company line. The pants on a double breasted style suit that James Cagney wore would also have baggy pleated pants while business suits were regular cut and flat front without pleats. Wearing spectator shoes was also something you would never see in an office anywhere but you would see a gangster in the movies wearing those fancy looking black and white dress shoes not giving a hoot if he stood out from the crowd because that is what he wanted to do.